A or B? It depends on C(oaching)! For the full description, click on https://leagueathletics.com/Page.asp?n=43308&org=WWQW.GJHA.NET, which is on the CYH website under Program Information. Players will obviously have a range of strengths and weaknesses; their scores will help to create teams of players that will complement each other’s skills. Many players are often in the same range of evaluation scores. If skill level is greater, that is the determining factor in placement. When the 3 evaluation items are equal, 2nd-year players may have preference. There is also value in keeping teammates together to encourage the comradery and teamwork that has been formed in past years. Youth sports are so much more than just growing hockey skills. It teaches kids how to work together, rely on others, be part of a group effort, experience winning and losing, and develop as a person and an athlete. The initial rosters are released prior to the start of the season and changes may be made due to new registrations, players withdrawing, or if a player has been placed above or below their skill set. All members who take part in the evaluation and team forming process are volunteers and strive to give each player the very best opportunity within the Crusaders Youth Hockey organization. For any further evaluation/placement matters, contact Dan McNabb E: , Gino Polcaro E: . Lee Holbrook E: is available as the Player Rep also. When it comes to the alphabet and hockey, for some, the letter A and the letter B might just a well sit 200 feet apart. But what’s in a letter? 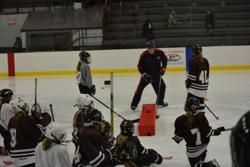 When comes to labels, Roger Grillo, who as regional manager of the American Development Model for Massachusetts and New England, has traveled to countless rinks and coached countless players, doesn’t see any make-or-break moments coming out of either. And that’s a good thing. Particularly at the younger ages, As and Bs, and the parents of As and Bs, shouldn’t focus more on the letter at the top of the roster sheet than on the experience of the player. For youth hockey players, As and Bs shouldn’t be confused for grades and they shouldn’t be separated by philosophy. In fact, says Grillo, there are many times they shouldn’t be separated at all. One way to do that is to look at hockey through the players’ sets of eyes and taking a look at those goals, dreams and aspirations, then thinking about how an individual player can get there. Still, there are disappointments. No matter how young a player is, almost as wired into their ability to count is their ability to recognize how rosters can be constructed. There’s no shame in those disappointments, just as there’s no shame in not making a certain team. At the end of the day, there are only so many spots. Parents and families can help with this process, too. “Make sure they are having fun, handle that with class,” says Grillo of the role adults play in a youth player’s learning to navigate perceived failures. In the right programs, the B team is just as much an opportunity as the A team or the C team. That evenness of the experience and egalitarian approach also serves to remind both players and their families that there will be no suffering from negative consequences once they arrive at the rink. Their ceilings, especially at the younger ages, don’t have to be affected in the least. We have enabled ONLINE payments for tuitions, the most convenient way for you to pay directly to your account using a credit card. You can follow these simple instructions to do so: Sign in to your account on the CYH homepage-- www.crusadersyouthhockey.org. Once signed in, click on "MY ACCOUNT" tab at the top of the page. This will bring you to a page with all registered family members listed. Scroll down to the bottom, click on the green tab in the right-hand corner labeled "PAY NOW", which will bring you to a new page. From there, fill in the required fields, submit, and success! If you have any questions regarding tuition and payments, please contact our Treasurer, Michele Allan at .